Summary: The Debris Evolution Uncertainty Quantification (DEUQ) is a project jointly led by Belstead Research Limited (BRL) and the Department of Mechanical and Aerospace Engineering at the University of Strathclyde (UoS). Part of it was also conducted in collaboration with the Research Institute for Sustainable Humanosphere at the University of Kyoto in Japan. To model and simulate the dynamics of high area to mass ratio (HAMR) objects during de-orbiting and re-entry. To analyse the de-orbiting and re-entry dynamics of drag sails. 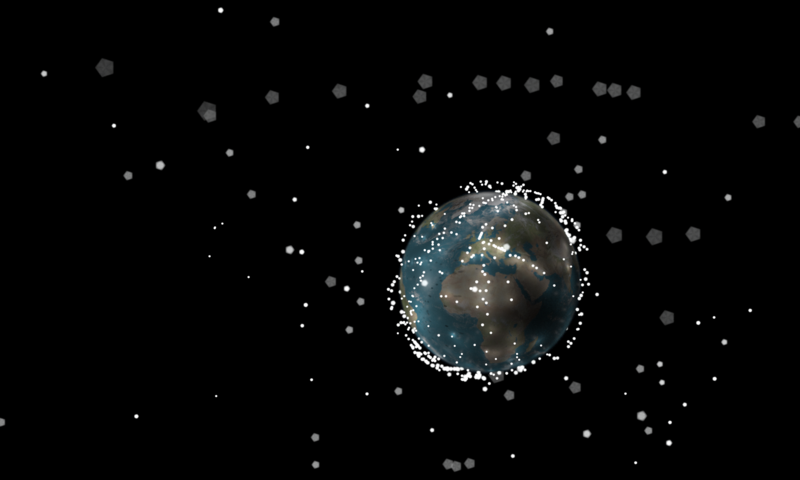 To analyse the de-orbiting and re-entry dynamics of fragments. To analyse the dynamics of debris in LEO subject to Lorentz force (ionospheric effects). 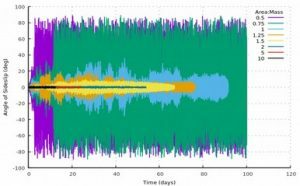 To test fast uncertainty propagation techniques against direct Monte Carlo simulations on the re-entry of HAMR objects. To quantify the uncertainty on the re-entry time of HAMR objects. To quantify the uncertainty of low-fidelity models (3dof) compared to high fidelity 6dof simulations. BRL has stretched the envelope of its state-of-the-art 3DoF and 6DoF destructive re-entry codes and applied them to the analysis of the long term aerodynamic stability of TechDemoSat-1 and drag sails more generally. In doing so, it has found that the stability of vehicles with drag sails is highly dependent on their geometry, with many configurations proving to be unstable at altitudes of 600km, rapidly tending to a tumbling motion. Stable configurations have been found to be those with large sail areas and pyramid sails with sail angles greater than 30 degrees. However, even for these geometries, stable flight requires an initial state close to an aerodynamically stable attitude. For a given sail area, pyramid sails are seen to be more stable than flat geometries, however, it is still unlikely that a vehicle will maintain an aerodynamically stable orientation without active control. Additionally, when the vehicle tumbles, the drag generated per unit sail area is maximised by using less stable flat sail geometries. This suggests that drag sail development should be focused on flat sails, and in doing so the vehicle should be assumed to tumble. Following this approach will provide a drag sail, and re-entry estimates, which are appropriate to a general case. In collaboration with Kyoto University, the UoS has developed a model for surface charging of space objects in Low Earth Orbit (LEO). Coupled with the International Reference Ionosphere (IRI) 2012, it can be used to estimate the electrostatic charge of a sphere or a flat plate at altitudes between 80 and 2000km and from years 1940 to 2020. This tool was included in Strathclyde’s orbit propagator to compute the resulting Lorentz force and analyse its effects on the dynamics of space debris. Figure 3 shows an example of on-orbit predictions of the surface charge. Simulations over 100 days demonstrate a negligible impact on the Keplerian coordinates, but a potential significant one on attitude when an associated torque is induced by a displacement between centres of gravity and symmetry. Unfortunately, the radar available in the Japanese laboratory did not perform well enough for tracking measurements to be used in a meaningful way. In addition, the UoS has extended the capabilities of its in-house orbit propagator from the 3DoF of a sphere to 6DoF simulating a square flat plate. An aerodynamic database was produced from Direct Simulations Monte Carlo and interpolated in the simulator. 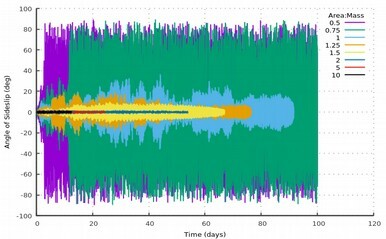 Modern non-intrusive uncertainty quantification techniques were used both on Strathclyde and BRL’s propagators to probe the effects of initial conditions, object’s properties and atmospheric parameters on orbit decay and time of re-entry. In particular, comparisons between probabilistic distributions showed that it is acceptable to substitute 3DoF propagations to more computationally expansive 6DoF ones as long as the object is expected to remain in the same regime i.e. have a tumbling behaviour or stay stable.